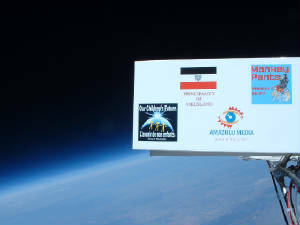 We have made history by being the first micronation to send our flag into space. We partnered with JP Aerospace to complete this historic mission. In August of 2008 the AWAY 35 was sent up with our old national flag on it to the edge of the vacuum of space. We thank JP Aerospace and fully support thier program. Ground prep and launch of the AWAY 35 mission. A picture of our old Flag out on the edge of space aboard the AWAY 35 mission. On August 16th, 2008 Micronational history was made when the launch of the AWAY 35 mission by JP AEROSPACE carried the Vikeslandic national flag to the edge of space. This is Historical, as far as is known no other micronation has accomplished this feat to date. The AWAY mission was launched from the desert floor by Black Rock Nevada. The launch vehicle is carried to the edge of the stratosphere by large balloons. The vehicle itself carries video cameras as well as still cameras and has various scientific instruments that collect data during the mission. As well small instruments known as PONGSATS are aboard and carry out a wide variety of functions when kissing the vacuum of space. The Vikeslandic Department of Aeronautics and Space helped sponsor the AWAY 35 mission and in turn had the flag taken up to the final frontier. Prince Christopher I of Vikesland said, "Let the Micronational space race begin! I invite all other small nations to do the same or go beyond this historical accomplishment." JP Aerospace is dubbed as "Americas other space program" and is indeed a great partner for those who are interested in becoming involved or sponsoring an AWAY mission. The whole mission was documented on video and our national flag is clearly seen on the craft as it is prepared for launch on the desert floor. Please visit the JP Aerospace website to learn more about their space program. This rocket can be used to deploy emergency radio transmitting pods. In the near future a mid powered rocket may be utilized to send up a camera and transmitter to video tape the geography below. As well a low earth orbit project is in the works. By permission of HRH King Christopher I. Except for any Logos already trademarked and Copyrighted by outside agencies. The Kingdom of Vikesland is not responsible for the content of any websites that are linked to this one. Any damages experienced from the use of content within this website are solely the responsibility of the visiting individual.